Figure 1. On-Bead Post-Capture PCR Amplification Enhances Enrichment. Target capture was performed using xGen® Lockdown® Probes and SeqCap® EZ Hybridization and Wash Kit. 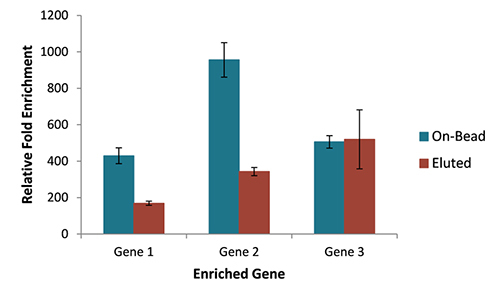 Relative levels of three target genes after enrichment were measured by qPCR. Scientists at Geneseeq Technology share how to improve target capture for accurate clinical diagnostics by using optimized blocking oligonucleotides and stringent hybridization conditions. The diverse array of mutations contributing to cancer complicates the selection of effective treatment regimens. There are only several hundred genes that can be targeted for cancer treatment, and the current trend is to selectively sequence these. Personalized medicine is helping clinicians to make informed treatment decisions and is facilitated by the latest next generation sequencing (NGS) technologies. Target capture is a more pragmatic alternative to whole genome sequencing that focuses on selected genomic regions and presents an ideal approach for the routine clinical application of NGS. However, this technique must be carefully optimized to ensure accurate data.